Shyloh Belnap: Look at the new layouts we added today! Look at the new layouts we added today! 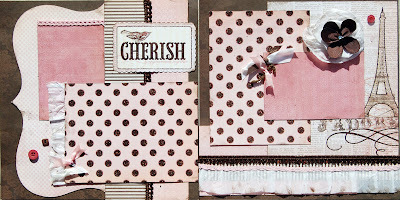 This fun layout was designed by JULIE BONNER! Buttons, fun paper and GLITTER letters make this a fun layout to assemble. You will be using a full package of glitter letters so you are able to use any title you would like if Grow does not apply. We did have to substitute Glitter letters in a similar font because the foam letters shown were discontinued! Julie also designed this fun layout. It can be used for gorgeous wedding pictures or any other occasion you would like because it comes with a full package of letters for the title! You will Cherish this layout by Heidi Vassel. 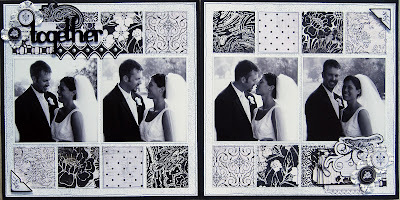 She designed this layout with glitter paper, a grosgrain flower and gorgeous ribbon! I am so very thankful for all of my many, many blessings. Thanksgiving is really a time to reflect on the things we are so thankful for such a family, home, children, grandchildren, etc. All given by a loving Father in Heaven.